In most cases, commercial HVAC systems simply provide comfort. However, healthcare facilities demand much more out of their HVAC. In fact, modern hospitals can’t function without a working HVAC system. Why? Because they help keep doctors and patients healthy and safe. Therefore, it’s very important to have a team of HVAC professionals who understand the unique needs of a medical facility. And, this is not something every commercial HVAC contractor is familiar with. The Severn Group, on the other hand, has the knowledge to install a custom HVAC for your hospital or clinic. Below is an overview of the critical needs and standards for designing these specialized HVAC systems. HVAC systems in healthcare facilities are critical for providing health, safety, and comfort. And, to ensure these standards, there are several main functions within the system. Some of these functions include temperature control, infection control, and odor. Temperature Control- Temperature affects patients, staff and even medical equipment. Not only that, but some rooms have different temperature needs. For example, most operating rooms have to be cool. Otherwise, surgeons might overheat in their gowns, caps, and gloves. On the other hand, burn units are warmer as patients can no longer keep their own bodies warm. Infection Control- HVAC systems filter and remove dirty air and introduce clean air. Primarily, these air changes help get rid of bacteria and other suspended microorganisms, which reduces airborne disease risk. 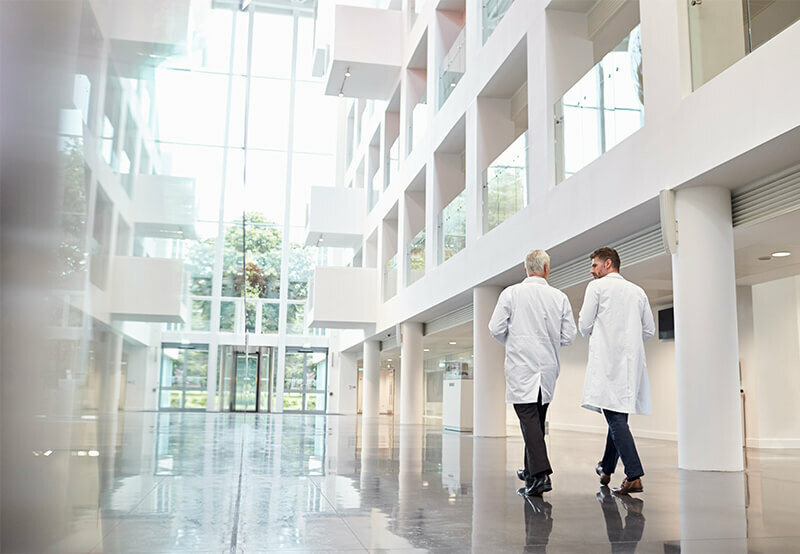 Because Hospital Acquired Infections (HIAs) are a major threat, healthcare facilities rely heavily on their HVAC to help control potential contaminants. Some rooms may even require multiple air changes every hour. Odor Control- While healthcare facilities are required to be clean and sterile, unpleasant odors can still persist. However, as the HVAC system circulates air, it helps dispel odors faster. This increases staff, patient and visitor comfort. And, the better the air quality, the better for everyone. While these are just a few main functions, HVAC systems are important in many other ways. In the end, HVAC systems help facilities run smoothly. Most importantly, they protect the health and safety of the people inside. That’s why these projects require a higher skill level and more expertise than the typical building. As we’ve learned, it’s clear that HVAC design is a delicate job. Not only should the system meet certain needs, but it must also comply with strict building codes. And, these buildings aren’t small. Just take Johns Hopkins Hospital in Baltimore for example. The hospital has 33 operating rooms and more than 600 private patient rooms. Therefore, the HVAC must be designed around all these spaces’ unique needs. In particular, the number of air changes and the speed of the air filters are all factors to consider for each room. In addition, HVAC maintenance is critical. Regular cleaning and monitoring are vital to prevent issues. And, downtime is simply not an option for most hospitals. Also, maintaining energy efficiency is another concern. If the system isn’t running effectively, it can drive up monthly heating and cooling costs. Overall, that’s valuable hospital resources that are better spent elsewhere. If you’d like to talk about your hospital’s HVAC needs, please contact us at (301) 249-4062. We’ll work together to create solutions for all of your goals.